The City has selected Commercial Waste Services as its new waste and recycling hauler for all residential, commercial and multi-family properties beginning September 7, 2018. Commercial Waste Services is reaching out to residents and commercial customers to provide their containers as well as background and education on the transition and new services added. Earlier this year the City terminated the contract if Consolidated Waste Services LLC, otherwise known as CDS. 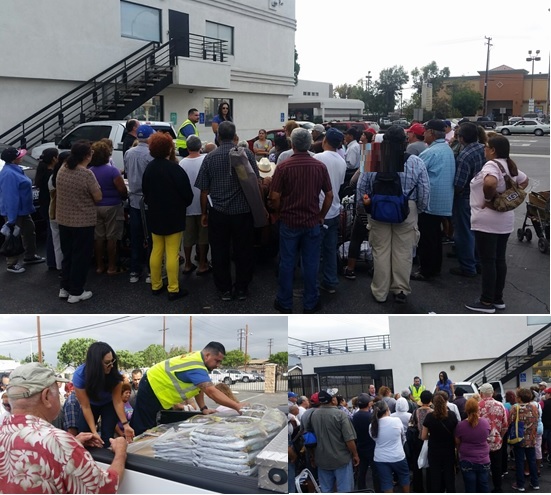 That termination was based on a number if contractual violations and included allegations filed in two separate Complaints in Los Angeles Superior Court that CDS had been fraudulent overcharging the residents and commercial interests over many years. 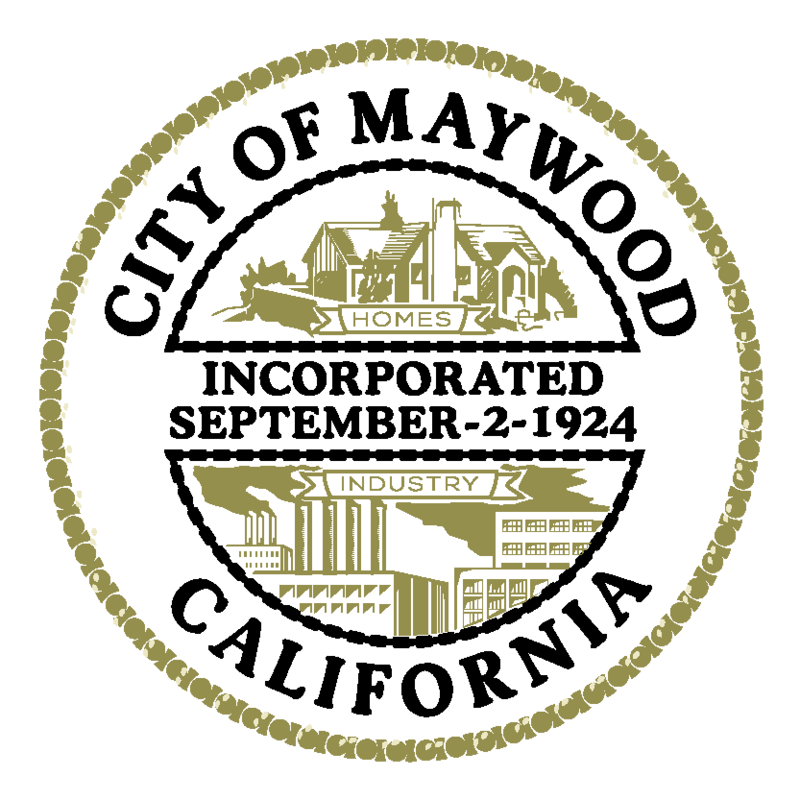 Unfortunately, CDS then refused to leave the City when terminated, which resulted in the City pursuing and securing a recent Court Order prohibiting CDS' continued activities in Maywood. As a result of this court order, CDS began removing their Waste Containers on September 6th, which is the cause for this Immediate transition. Commercial Waste Services was found to be the most qualified waste and recycling company to service the needs if the community at reduced rates and had the equipment available to provide the smoothest transition possible in the short timeframe provided by the previous hauling company. For that reason, The City Council selected them as the City's new Waste and Recycling Service Provider. Both residential and commercial customers will be able to make changes to their services. The previous waste hauler has already begun removing bins and carts from the City and this will continue until all carts and bins have been serviced and removed. Commercial Waste Services will begin delivering trash carts and bins on Friday, September 7th through Monday, September 10th. Recycling Carts and bins will be delivered the following week. We anticipate that this positive move toward providing excellent service will not interrupt service and apologize for any inconvenience that you may experience during this transitional phase. We appreciate your patience and ask that if you need assistance, to please contact Commercial Waste Services at 833-449-2783 who will be happy to assist you. The new contract will offer residents and commercial properties the same service options as the previous hauler. Likewise, there will be no changes to the collection day schedule. All customers will see a decrease in rates. Cart served residential customers will be offered additional services including weekly green waste collection, as well as bulky item/electronic waste collection six (6) times per year at no additional cost. You will notice that the new carts are all black with different color lids to distinguish trash, recycling and green waste. Please dispose of all materials in the correct cart. Additional trash containers are available at a fee. Upon request, you may receive one (1) additional recycling or yard waste container at no charge. More than one will result in an additional fee. Each residence residence receives one set of carts, consisting of trash (BLACK LID), recycling (BLUE LID) and green waste (GREEN LID). Please contact Commercial Waste Services at (833)449-2783 to schedule delivery or replacement. Household Hazardous Waste should never be placed in Commercial Waste Services Trash, Recycling, or Green Waste. 1-888-Clean-LA or 1-800-238-0172. You can also dispose of used motor oil at more then 600 oil recycling centers in Los Angeles County. For a complete lisiting call: 1-888-Clean-LA. In an effort to recycle our trash and make sure we get the right waste to the right place, Commercial Waste Services use a three can system for residential trash, Recycling and green waste services. Sometimes knowing what waste can go into what may seem a bit confusing so we have provided a list below to help you. Note that some items, such as Bamboo, Ivy, and Palm Fronds which can cause damage to processing equipment, are not listed under Green Waste as they are categorized as trash. Please note that contaminated carts will be red tagged and not serviced. What is grasscycling? Grasscycling is the natural recycling of grass by leaving clipping on the lawn after mowing. Grass clippings decompose quickly, returning valuable nutrients back into the soil. Grasscycling is great for your lawn on a number on a number of levels. Whether you are mulching leaves or returning lawn clippings back into the lawn, mulching saves time, money and labor, and is a great soil amendment. There is really no need for raking, bagging or hauling away either leaves or clippings. Grass clippings account for 75 percent of all yard waste. You can save one-third of your annual lawn care time by mowing frequently and not collecting clippings. Clippings left on the lawn recycle nutrients, saving about 25 percent of your annual fertilizer cost. According to Dr. Norman Hummel Jr., turf grass specialist at Cornell University, "one ton of fresh clippings contain approximately 15 pounds of nitrogen, 2 pounds of phosphorous and 10 pounds of potassium - the three major nutrients [for sustaining plant life] - and smaller quantities of the other elements essential for plant life." We must stop thinking of grass clippings as "garbage." According to a University of Connecticut research scientist, clippings left on the lawn can increase the organic content of the soil and lead to increased earthworm activity. Earthworms improve aeration and water movement through the soil, providing a better environment for plant growth. One ton of grass clippings contains more than 1,700 pounds of water. Leaving clippings on the lawn save tax dollars spent for labor, fuel costs and dumping fees that are incurred to dispose of this moisture-laden material. Many residents in out community maintain beautiful gardens and landscapes that add to the overall beauty of our neighborhoods. Historically, gardening has been a popular pastime and a source of pride for homeowners. More recently, gardening has evolved into Smart Gardening. The techniques of Smart Gardening take into consideration climate, seasonal changes, native species plants, and conservation. By practicing Smart Gardening, homeowners can conserve water, conserve energy, save time and money, recycle yard waste, recycle kitchen scraps, reduce waste, produce rich compost, and more. The end is a healthy and vibrant garden. To learn more about Smart Gardening techniques and applications, please visit the County of Los Angeles Smart Gardening at http://dpw.lacounty.gov/epd/sg/. Be sure to read about the informative Smart Gardening workshops offered by the County of LA. Most workshops are free of charge, and are taught by master gardeners from throughout our region. Smart Gardening workshops cover the topics of backyard composting, worm composting, grass cycling, water-wise gardening, fire-wise gardening, natural pest management, and drought tolerant native species plants. Residents may purchase compost bins from most workshops at a discounted price. Why did I get a red tag on my cart? Single Family Residential Customers shall receive four (4) bulky item(s) pickups per year for free. There is a limit of 6 items per pickup. Bulky items serviced on Thursdays only. Bulky items include: furniture (chairs, sofas, mattresses and rugs); appliances (refrigerators, ranges, washers, dryers, water heaters, dishwashers, plumbing and small household appliances); and electronic waste. Please contact Commercial Waste Service 24 hours in advance of pickup at (833)449-2783. Commercial Waste Services will collect Christmas trees on regular collection days commencing the day after Christmas and culminating 3 weeks thereafter. Trees should be cut to no longer than 5 feet. The lights, ornaments and tree stands must be removed before placing at curbside. Commercial and multi-family properties will also be offered additional services included recycling and organics collection. Commercial and multi-family properties will also see a decrease in their waste collection rate. With the passage of AB 341 (Chapter 476, Statutes of 2011 [Chesbro, AB 341]). California is one of the first states in the nation to enact a statewide program to reduce greenhouse gas emissions by diverting commercial solid waste from landfills. State mandatory recycling for businesses and multi-family properties began July 1,2012. 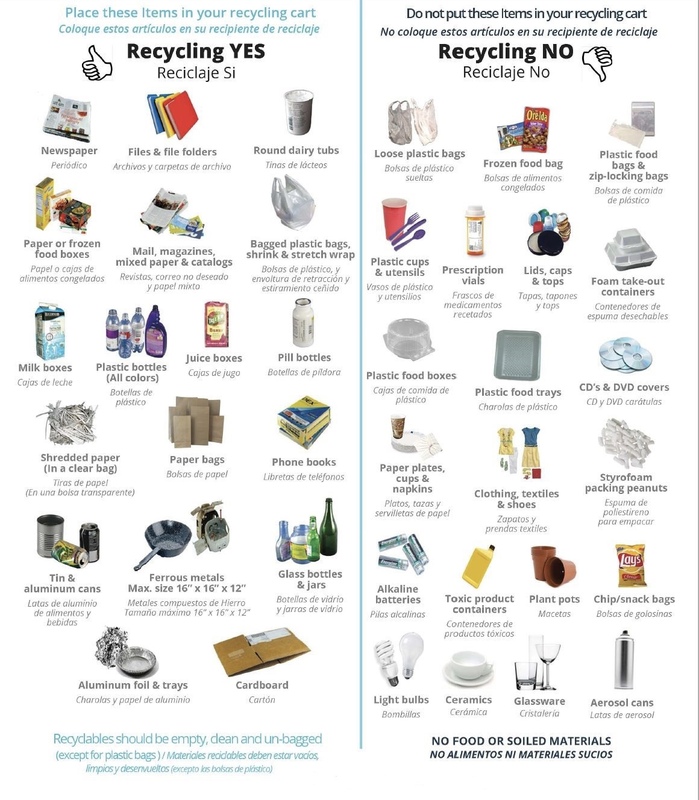 AB 341 requires all businesses that generate 4 or more cubic yards of waste weekly and apartment communities/multi-family housing with 5 or more units to recycle. In 2014, AB 1826 Chesbro (Chapter 727, Statutes of 2014) was signed into law, requiring businesses, including apartment communities/multi-family housing with 5 or more units, to recycle organic waste based on the amount of waste generated each week. * Organic Waste includes food waste, green waste, landscape and pruning waste, nonhazardous wood waste, and food-soiled paper. Businesses and multi-family housing units generating 8 cubic yards or more of organic waste per week were required to have organics recycling in place by April 1, 2016. Businesses and multi-family housing units generating 4 cubic yards of organic waste per week must arrange to recycle their organics by January 1, 2017. *Note: Multi-family housing units are not required to have food waste diversion program, but must recycle green/landscaping waste. Bulky item pickup is available to commercial business. 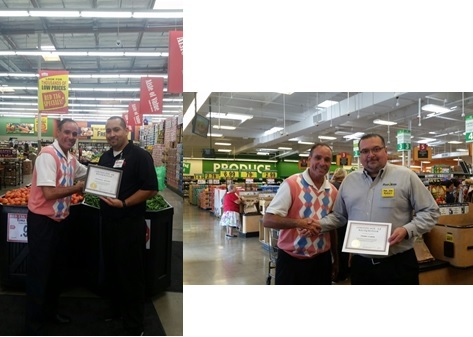 If you would like to find out more, please call our customer service department at (833)449-2783 .